Acknowledged by peers, the women he dressed, and the press as “the most Parisian of fashion designers”, Robert Piguet, while programmed to be a financier, was, in fact, destined to become one of the legendary figures of haute couture. There are the fragrances, a contribution of unrivalled magnitude. It has been observed that Piguet’s perfumes – Bandit, Fracas and Baghari, “have a particular feel, very characteristic of his trademarks: strict adherence to good taste, true luxury, a horror of the commonplace and an innate sense of seduction” True classics of timeless beauty and value that endure far beyond season and trend. 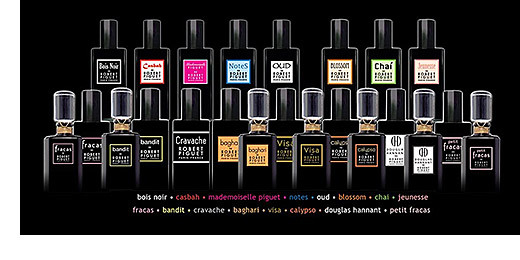 Designer Robert Piguet has 25 perfumes. Robert Piguet is an old perfume house. The earliest edition was created in 1944 and the newest is from 2014. Robert Piguet fragrances were made in collaboration with perfumers Aurelien Guichard and Germaine Cellier. Subway st.: "Muzeum" & "Můstek"